Airlines r a great public service, endorsed by Skol. Thread: Airlines r a great public service, endorsed by Skol. Well Skol ,u had your opportunity. I will give #1 of a lot of reasons why not to invest in airlines. Last edited by tricha; 16-10-2008 at 10:59 AM. Are you digging yourself a bunker and stockin up down there on the west coast too Tricha? Doesnt that fella in Texas realize where he lives. Nobody else will prepare and when the **** does hit the fan and the last can of beans runs out they will come with guns and take it all off him. Last edited by STRAT; 27-07-2008 at 10:48 AM. Take a look at American airlines (AMR) on the NYSE. Doubled in two days! US Airways (LCC) a two and a half bagger in 5 days! Well he's got plenty of guns Strat I thought he would have a horse, but I guess with all that alchohol he will still be able to drive. Nah I have not got the bunker, but hey, 30 grape vines so that could be fun. Last edited by Skol; 27-07-2008 at 08:36 PM. Sorry Skol, I would have prefered that u started this thread. Start another one if u would like, they r not my cup of tea. Given the context in which it is now operating, the Qantas board’s decision to appoint Jetstar’s chief executive, Alan Joyce, to succeed Geoff Dixon, is perhaps something of a surprise. The personable Irishman was one of three very strong internal contenders for the job. The others were John Borghetti, who has very successfully managed the Qantas business, and chief financial officer Peter Gregg. Either Borghetti or Gregg would have been seen as a safe pair of hands during a very turbulent and threatening period in the history of the Qantas group, with record oil prices threatening the viability of the entire industry and forcing Qantas and its global peers to take dramatic steps to enhance their ability to survive. Only this month Dixon announced another severe reduction in capacity and 1500 job losses as Qantas seeks to mitigate the impact of the oil price and a slowing global and domestic economy. The choice of Dixon’s successor was always going to be a delicate one given that, despite Dixon’s success in positioning Qantas as one of the most profitable and dynamic of the international carriers during his seven years at the helm, the environment in which the airline is operating remains in a challenging state of flux. Joyce, 42, is an ebullient and entrepreneurial character who has done a terrific job of launching Jetstar, positioning it as the lowest-cost domestic carrier and building the fledgling outlines of an international network. He joined Qantas from Aer Lingus in 2003. Jetstar has been the beneficiary of Dixon’s strategy of shifting lower-margin routes from the Qantas brands to the lower-cost carrier, but Joyce has managed that shift in capacity and volume seamlessly and the brand has won accolades within the international aviation community. The additional challenge confronting him when he takes over from Dixon in November after the Qantas annual general meeting will be not only retaining Borghetti and Gregg but maintaining what has been a very stable and respected senior executive team, at a point where stability and experience is valuable. The decision to appoint Joyce underscores what was already evident. The Qantas board sees Jetstar and its low-cost platform as the future of the Qantas group. The Qantas brand will remain, but it appears it will increasingly be targeted to higher-margin routes that attract business customers. Given the increasing emphasis on Jetstar, it makes sense to appoint a CEO with Joyce’s background and experience in, not just the Jetstar brand and strategies, but low-cost carriers more generally. The Qantas board may also feel that Joyce, who conveys an impression of, if not hyperactivity, then considerable energy, might be best suited to oversee a period of significant and rapid structural change in the group. Qantas is preparing for the float of its frequent flyer program, it has plans for the future spin-outs of its freight interests and, if market conditions do improve, a vehicle that would own its fleet and leases. When Dixon announced the capacity cuts earlier this month, Qantas’ international network was cut while Jetstar’s is likely to grow by 15 per cent-plus – the conditions are accelerating and amplifying the strategy of displacing Qantas with the Jetstar brand on the more marginal routes, both the domestic and, increasingly, the international routes. The Qantas board and its relatively new chairman Leigh Clifford (he became chairman last November) have handled a difficult and potentially destabilising process well. It was good governance that the succession process was left to Clifford, the incoming chairman, rather than Margaret Jackson, the outgoing chairman. Jackson and Dixon, in particular, deserve credit for ensuring there were a number of high-calibre internal candidates to choose from. There was never any real likelihood that Qantas would bring someone in from outside the group. Dixon, of course, will go down in Qantas’ history as a pivotal figure. He has led the airline through a succession of threats and challenges, reinventing it continuously to maintain its reputation as one of the world’s best and most profitable carriers. The launch of Jetstar and the continuing and substantial shift of Qantas volume onto a separately-branded lower-cost platform was, given the failure of similar attempts offshore, a remarkable achievement. Dixon might be handing Qantas over to Joyce at one of the most difficult moments in the industry’s history – which is saying something, given the roller-coaster nature of the industry’s fortunes – but he will hand it over in pretty good shape, relative to its competitors. Ryanair will maintain "aggressive pricing" to lure passengers. Ryanair has warned it could make an annual loss of up to 60 million euros (£47.4m) if oil prices stayed high and it continued cutting fares. The budget carrier said net profits in the three months to the end of June had fallen by 85% to 21m euros - below analysts expectations. And it added that it was yet to fully hedge the price it paid for oil. 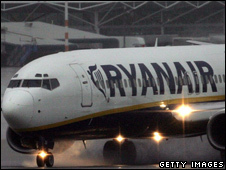 Ryanair's downbeat predictions saw its shares fall 15% while British Airways slipped back 4.7% and Easyjet lost 10%. The soaring price of jet fuel, combined with customers cutting back on flying, has seen many airlines struggle. Chief executive Michael O'Leary said that Ryanair expected to break even at best in the year to March 2009, although he warned the company could lose up to 60m euros. This compares with a profit of 480.9m euros in the previous year. Ryanair's fuel bill now represents almost 50% of its operating costs, compared with 36% last year. Oil hit $147 a barrel earlier this month - though recently it has fallen back to close to $130. The airline said that the recent fall in prices had been used to hedge 90% of its fuel needs for September at $129 per barrel and 80% for the third quarter at $124 per barrel. However it was still liable for the full cost of oil in the fourth quarter. Full fares were likely to fall by 5% as it battled for customers amid plunging confidence, it added. "The outlook for the remainder of the fiscal year, which is entirely dependent on fares and fuel prices, remains poor," Mr O'Leary said. He said it would look to maintain "aggressive pricing" in order to maintain high plane usage and would avoid fuel surcharges. Earlier this month, Ryanair said it would cut about 250 flights from Stansted this winter as it tries to offset the increased oil prices. And its rival Easyjet has said that it will cut flights over the winter to offset a challenging economic climate and the high fuel prices that have dented profit growth. Yes I deliberately chose AMR's ticker name as my username, I picked up the name while playing a stockmarket game (Wall$treet raider). I made a Buffett-like fortune by acquiring AMR after the US declared war on Iran and detonated a warhead in Tehran, and then selling out after the US flooded the world with cheap oil in the aftermath. But yes, airlines are a **** investment in RL. As an industry they lose money half the time. It doesn't mean you can't take advantage of uptrends in the share price though and then dump them quickly. Tricha an oil bull, with 100% invested in oil and no cash described me as having 'serious rocks in my head' (on or about 16 July) on this forum for suggesting airlines as an investment. Consequently he decided to start this thread to humiliate me for making such an idiotic suggestion .I never said you had to own them forever. Here are the relative performance of Trichas liquid gold oil shares he says he owns vs. 3 airline shares from 16/7 to 28/7. Readers can decide for themselves which has been the better investment and with the oil price imploding my guess is Tricha's fortunes won't be turning around any time soon. Last edited by Skol; 29-07-2008 at 04:42 PM. Get pissed on the wine and then go driving in your alchohol induced vehicle. The beauty of it the cops will be driving around on horses. Oh and Strat, I've just taken a leaf out of your book. for that matter which book?